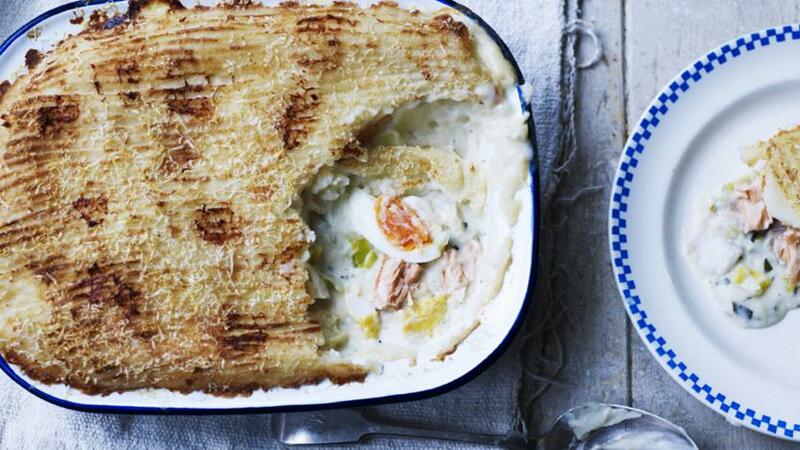 A lovely fish pie is always a great dish to make ahead and serve for a big family gathering or even a casual supper party with friends. The white wine and leeks make this pie taste a little more sophisticated than usual, but you can use all milk if you are feeding children. Put the potatoes into a saucepan of cold salted water. Bring up to the boil and simmer until completely tender. Drain well and then mash with the butter and milk. Add pepper and taste to check the seasoning. Add salt and more pepper if necessary. For the fish filling, melt the butter in a saucepan, add the leeks and stir over the heat. Cover with a lid and simmer gently for 10 minutes, or until soft. Measure the flour into a small bowl. Add the wine and whisk together until smooth. Add the milk to the leeks, bring to the boil and then add the wine mixture. Stir briskly until thickened. Season and add the parsley and fish. Stir over the heat for two minutes, then spoon into an ovenproof casserole. Scatter over the eggs. Allow to cool until firm. Spoon the mashed potatoes over the fish mixture and mark with a fork. Sprinkle with cheese. The pie can be made and chilled in the fridge for up to 12 hours before cooking. If you want to make and freeze this, omit the eggs as they become tough and rubbery when frozen. You can of course use just haddock, cod or salmon, or add a few prawns and some mussels too if liked. You could also make the sauce with cider instead of wine. I sometimes add some spinach or peas to the mixture too.